You are here: Home / Functional Health and Wellness / Alternative Healing / It’s Strep throat? When Antibiotics are the Answer. If you have been around ANY length of time, you know that I am pretty hard nosed AGAINST most everything in the traditional medical paradigm. I am not a fan of vaccines, grains, vitamins, medications, bandaids (literal bandaids or those that mask symptoms), over-the-counter meds, the list goes on and on. And I would say, I’m beyond not a fan, I will down-right science you into submission as to why they are no good. I take care of myself 95% of the time, like real good care of myself. I figured out that waking up feeling good and loving my body is really important to my happiness and survival. I eat healthy organic foods, I get plenty of sunshine and movement, and bare feet and meditation. I used to get sick ALOT. I used to take medication for headaches and hypertension, and allergies…did you know I don’t even HAVE ALLERGIES anymore? Like gone…none. Seasonal allergies? BYE Felicia! I also used to get strep a minimum of twice per year too! All of that being said, I haven’t been sick in over a year, not even under-the-weather in a wee bit with a cold in more than 6 months. BUT Friday morning came along…oh crap. I woke up just feeling kind bleh. Normally I bounce out of bed, no worries but today I felt icky. I like I wanted to stay in bed, and that is pretty unusual for me. Later in the day I didn’t feel like working out, so I just did some gentle yoga. By the time evening rolled around I was relieved that my hubby came home early to help entertain the kids because I was feverish and my throat hurt. comfort for the fever…no fever reducers here! Too little too late, I woke up Saturday morning feeling like I had swallowed glass, my ears ached, and my fever was raging. One look at my tonsils and I knew exactly what I had…strep throat. Now there are some remedies for strep, I have cured it before in the past with oregano oil and tea tree. I know that gargling Apple Cider Vinegar will knock it out quickly…I even got rid of strep WHILE tent camping, and this was before I had my head on straight about the importance of what I put in and on my body. This isn’t a decision I take lightly, and one that I usually don’t even teach, advise or give as an option. I have ridden out strep and holistically treated it and while it’s never “easy” (neither is taking antibiotics) this was different. I sat in meditation Saturday morning for a long time trying to decipher my intuitive nudge to go to the doctor. I sorted through, “nah it means you need to go to the chiropractor and get adjusted”…nope…this was a definite push to step into the dreaded medical paradigm that has failed me and others so often. 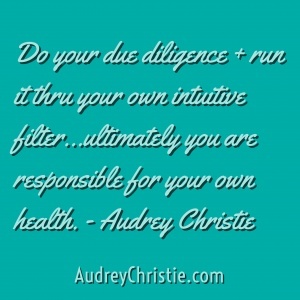 I always say, “do your due diligence AND run it through your own intuitive filter when making a health decision because ultimately YOU are responsible for your own health” and this was one of those times. I don’t advocate taking antibiotics (and never advocate them in our food/water supply) but sometimes they can be used wisely to quickly cure a disease. 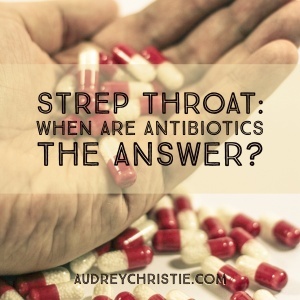 Strep, because it is something that you can test for and prove there is a bacterial infection is one of those rare times. Even though I DID take a 5 day course of antibiotics, I still used all of the healing measures above. I avoided fever reducers, got plenty of rest, etc to ensure my body had the utmost ability to heal. Reflecting back on the past few weeks, I know what got me… the last 2-3 weeks my diet was slipping, we dined out a lot more than normal, I hadn’t had time to make fresh green juice as much as normal. I wasn’t sleeping as well as I typically do, and due to clients in a different time zone, I was getting up at 4am weeks in a row. Just not nurturing myself like I should. And I ignored the wee-early nudges that were telling me to take better care of myself, to act now to prevent getting sick. So my immune system took a dive, and then I spent a week volunteering at the germ-y elementary school…yup it got me. Now that I have taken the antibiotics, I must do the work to repair my gut and microbiome otherwise I leave myself more susceptible to re-infection or other infections or even weight gain. I will tell you how to do that in an extra post later this week. Some people would have you believe that this takes at least a year…that’s only if you eat processed foods and don’t take care of yourself. More on that soon. What are your favorite strep remedies? What questions, thoughts do you have about when antibiotics are the solution you need?